NOTE: In some cases the final published version is not available in electronic form, in which case the latest available version is included (in reverse chronological order of publication). Inter-American Development Bank, 2006. With several co-authors. Exploratory analysis of public perceptions of innovative financing for infrastructure systems in the U.S.
Transportation Research Part A Policy and Practice, 70, November 2014.
en Investing in Water for a Green Economy: Services, Infrastructure, Policies and Management. Mike Young and Christine Esau, editors, Routledge, 2013. Working paper, presented at the 2010 Engineering Project Organizations Conference, EPOC, Lake Tahoe, November 2010. Journal of Construction Engineering and Management, April 2009. .
Financial Structuring of Infrastructure Projects in Public-Private Partnerships: A tool for designing feasible structures. 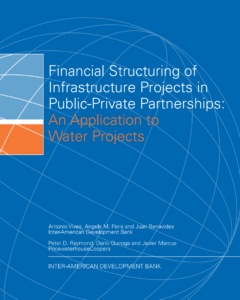 Public-Private Partnerships, Euromoney Books, 2008. Journal of Project Finance. Summer 2000. Energía en el Nuevo Milenio, Club Español de la Energía, Madrid, 2000. Journal of Project Finance, Summer 1999. Journal of Project Finance, Spring 1997.
with Martin Chrisney. Project Finance International, Americas Market Report, Spring 1996. Infrastructure. Spring 1996. Reprinted in The Economics of Public Private Partnerships, Edward Elgar Publishing, 2004.